Fully flavored, mixture of different Sages, including Gold, Purple, and Tricolor. Sweet, herby and colorful. 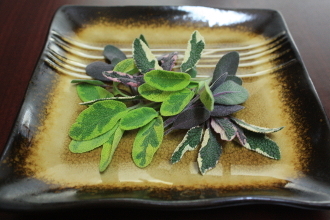 Soft textured long leaves; attractive addition to poultry, lamb and steak entrees. Creative decoration for ice cream desserts.